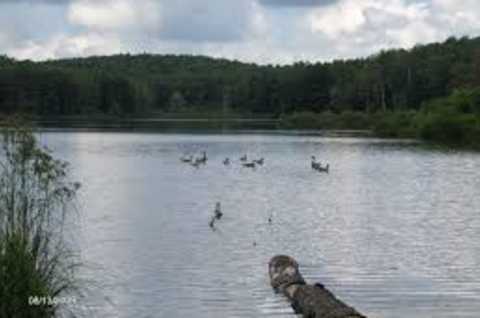 Stoney Pond, located in Madison County in the Town of Nelson, is part of the 1,469 acre Stoney Pond State Forest Area. 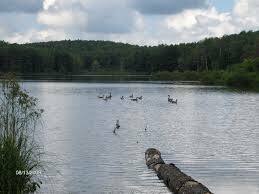 Physical Features: Elevation: 1600 feet Area: 28 acres Shoreline Length: 1.1 miles Length: 0.38 miles Maximum Depth: 12 feet Town: Nelson Aquatic Plant Life: Most of the shoreline of the pond has significant rooted aquatic vegetation growth. Access: Off Jones Road in the Town of Nelson. Hand launch. Parking for 6 cars. No Gas Powered Motors Allowed. Fish Species: Largemouth bass, chain pickerel, black crappie, pumpkinseed sunfish, bluegill, and golden shiner. Fishing: Because of its small size and high elevation, this is one of the first lakes in the area to ice-up and is a good early ice fishing location. However, the pond is located on a seasonal road that is not plowed, so on years of deep snow it can be hard to access. The pond is best suited for fishing from a kayak or canoe. There is some shore access at the launch site and along the dam. Panfish are very abundant but run on the small side, with few fish reaching 8 inches.